SPQR Blues is an ancient Roman epic (sort of) of Man vs. Volcano (and vs. a whole lot of other things) set in the years leading up to the eruption of Mount Vesuvius. It's been online for almost 10(!) years. Since I shifted from full-time editor to freelancer, I have time to work on it at least a little bit every day and finally blow up a volcano. As a freelancer, though, that also means that sometimes I have to fill every hour with assignments and can't give time to the webcomic. Because ordinary guys need epics too: Instead of a story about gladiators and emperors and orgies and assassinations (not that there's anything wrong with that), it’s about the lives of regular people in the city of Herculaneum, Pompeii's less famous neighbour—but there are the occasional banquets and battles, and sometimes a spoiled imperial prince gets in the way. A lot of the characters are based on people who really lived in the town. Our hero, Marcus Antonius Felix, self-described descendent of a slave of the much more famous Marcus Antonius, starts out jobless, homeless, and missing his clothing. Subsequently: intrigue, murders, flashbacks, goddesses, star-crossed lovers, ursine intervention, heroic accountants, gambling, slave-dealing, swords, sandals, earthquakes, seven emperors, and a jug of wine. You can read the first four chapters at spqrblues.com and on its old home on livejournal. Chapter IV is finished! ongoing. Rumour has it that enough people will survive the volcano for there to be a Chapter V. But they'll probably have to move to a new town, on account of theirs being buried by the whole volcano thing. Chapter V is ongoing, updating (usually) three times a week. Let's blow up a volcano, together: I'd like to continue posting a new comic three times a week, plus extra art, reviews, and other assorted posts. Posting times have been inconsistent in the past (to say the least), so pledges are per comic actually finished and online, instead of a pledge amount per month. Any extras won't be counted, such as sketches-of-the-day, revised older comics, Sunday colour comics, etc. What if there's a new comic daily or something? That's a lot to pledge for each month. You can opt to put a monthly cap on your pledges, so that even if there's a new comic every day, if you only want to pledge $5 per month maximum, you'll only be charged $5. Any pledge helps me spend time on the comic instead of filling every day and night with freelance work. Freelancing eats time like some sort of voracious hairy woodland beast. I'd love to swap some of those freelance hours for a regular drawing schedule. Every pledge is hugely helpful and hugely appreciated. Over time, I'll add extra goals and rewards. And...thanks! Thank you for supporting the rebirth and creation of SPQR Blues! You'll have access to the patrons-only sketch blog, too. I'll draw some art for you during my Friday gig at Carmine Street Comics. The sketch will be delivered at web resolution, 800x600, b&w or colour (your choice), via email attachment or download. Subject matter within reason, please. (A wee bit saucy might be okay.) It could be a character or two from SPQR Blues, something ancient, or something not. Well...just ask! 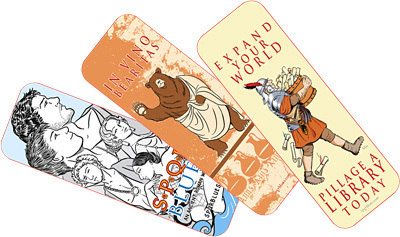 I've created three bookmarks for the comic so far: Pillage a Library, In Vino Bearitas, and the blue freebie bookmark. You'll get one of each and then, each month, everyone who's supported the comic with this pledge level will get a new bookmark with new art, exclusive for patrons only. (And I'll have someone helping to get everything sent out. Folks outside of the US may have to pay a little postage.) You'll get the digital sketchcard (see $5 pledge) and access to the patrons-only sketch blog too. POSSIBLE TIME TRAVEL. OR A CUSTOM COMIC EACH MONTH. WOW! Thanks! If you're able to support the comic for a month at this level, I'll draw a 4 or 5-panel comic for you. It can be a missing scene, something you wish had been explored more, something completely outside of the story canon, something with you time-travelling back to tell off Domitian. Come up with an idea and let's talk! You'll get a web-resolution scan of the art + the original art. You can decide whether or not we share it with other folks on the patrons-only blog. And you'll get the stuff from the other patron levels too. This would be amazing! I'll commit to posting a sketchcard-size drawing every day for Patrons only to see. Character studies, costume studies, Roman art and artifacts and architecture, bears in togas, that sort of thing. This'll be different than the usual sketch of the day, in that each week I'll send off that week's set of cards to one random lucky Patron.